CHARLOTTE AMALIE – Jews from Denmark first arrived on the white beaches of what is now St. Thomas, U.S. Virgin Islands — a tiny speck off the coast of Puerto Rico — in the mid-17th century. These were descendants of a Jewish population that had fled Spain for other parts of Europe during the Inquisition. St. Thomas afforded them a certain religious autonomy that wasn’t always available on the mainland. 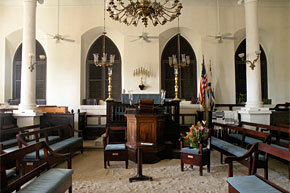 In the ensuing centuries, a Jewish community flourished in the capital city of Charlotte Amalie, which now boasts the St. Thomas Synagogue. Notably the synagogue is one of five in the world that features sand-covered floors. It’s not a tropical affectation — it dates back to the Inquisition-era custom of using sand to muffle forbidden prayer. And to get your imaginations going, you can read about 18th-century St. Thomas Jewry in Alice Hoffman’s newest novel, “The Marriage of Opposites,” a piece of historical fiction that centers on the (actual) life of Rachel Pizzaro, the mother of groundbreaking Jewish impressionist painter Camille Pissaro. Sorry, the Jews did not come from Denmark, many from Curacao.